Futures traders and economists are sending different signals about whether the Fed will raise interest rates. (Bloomberg) — U.S. 10-year Treasuries ended two days of declines as BlackRock Inc., the world’s biggest money manager, said markets would be able to handle an interest-rate increase by the Federal Reserve. Yields on two-year notes slipped from their highest level since April 2011 as traders awaited the outcome of the Fed’s two-day policy meeting, where officials led by Chair Janet Yellen may raise rates for the first time since 2006. BlackRock said the pace of rate increases rather than the date of the first move will drive market reaction. Treasuries held gains after separate reports showed new-home construction fell in August and jobless claims declined last week to the lowest level in two months. “If they did go today I actually think the market could absorb it relatively reasonably,” Stephen Cohen, BlackRock’s London-based chief investment strategist for international fixed income, said in an interview on Bloomberg Television’s “Countdown” with Guy Johnson and Anna Edwards. The yield on the benchmark 10-year Treasury fell one basis point, or 0.01 percentage point, to 2.28 percent as of 9:21 a.m. in New York, based on Bloomberg Bond Trader data. The yield climbed 11 basis points in the previous two days. The 2 percent security due in August 2025 advanced 2/32, or $0.63 per $1,000 face amount, to 97 15/32. Two-year note yields dropped one basis point to 0.80 percent, after climbing Wednesday to a 4 1/2-year high of 0.815 percent. While mixed data cloud the economic picture as policy makers meet, futures traders and economists are sending different signals about whether the Fed will raise rates. Traders are pricing in a 30 percent probability of an increase at the meeting concluding Thursday, down from 48 percent on July 30, based on the assumption that the effective fed funds rate will average 0.375 percent after the first increase, versus the current target of zero to 0.25 percent. Investors have dialed back expectations for higher rates since China’s devaluation last month sparked a selloff in global markets. At the same time, 54 of 113 economists surveyed by Bloomberg predict some kind of increase. “It’s not clear that it’s a done deal,” said Thanos Bardas, head of global rates at Neuberger Berman, which manages $107 billion in fixed-income assets. He said he thinks that if the Fed does move, it might raise interest rates by a smaller amount than normal or cut policy makers’ forecasts for the path of coming increases. “The next question for the bond market is where the Fed is going to stop,” he said. 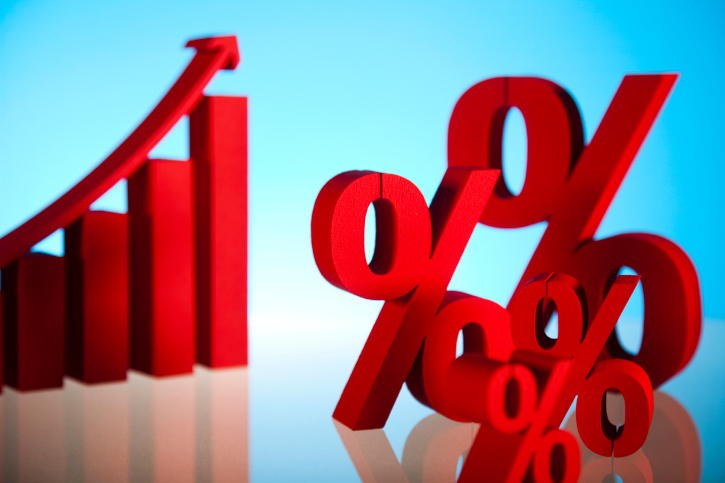 Residential starts declined 3 percent to a 1.13 million annualized rate from a 1.16 million pace the prior month that was slower than previously estimated, a Commerce Department report showed Thursday in Washington. Applications for unemployment benefits decreased by 11,000 to 264,000 in the week ended Sept. 12, a Labor Department report showed Thursday in Washington. –With assistance from Lucy Meakin and Eshe Nelson in London and Alexandra Scaggs in New York.